Now, five months later, Grant Hochstein just celebrated his 27th birthday and took some time to answer questions before the start of his final season as a competitor, which will be his ninth at the senior level. Figure Skaters Online (FSO): Can you reveal the thinking behind your 2017-18 season program music selections? How and why are they personal to you? Grant Hochstein (GH): Because this is my last season, I wanted my programs to be personal to me. I think one of the reasons I had difficulties last year was that I never connected to the programs on that personal level. For my short program, I’m skating to “Your Song” performed by Ewan McGregor from the Moulin Rouge! soundtrack. I wanted a piece of music that I could skate to and dedicate to Caroline [Zhang, his fiancee] as we close one chapter of our lives and begin another. I went back and forth on a few different pieces, one being my “Perfect” exhibition, but I always kept coming back to this music. It starts with “My gift is my song/And this one’s for you” and I think that is really fitting for what I’m trying to portray for her. My talent is skating and I’m dedicating this program to her and it’s something that I hope she feels as well. It is a simple gesture, but something that is meaningful to me. For my long program, I’m skating to “All I Ask of You” and “‘Music of the Night” from Phantom of the Opera. Before you all roll your eyes, remember that I asked for your patience and consideration when I announced my Les Miserables free skate two years ago and that worked out alright for me. The music has been done many times before, but there is a reason for that. People connect to the music and it resonates for them, and it does that for me as well. This program is one that I feel like sums up my skating career and is one that I’ve dedicated to all of the people who have stood by me and supported me throughout the years. It’s something that I can so easily imagine myself skating to at Nationals this season. The version of “Music of the Night” is sung by Colm Wilkinson who incidentally sang “Bring Him Home” [from Les Miserables] that I used in 2015-16. I felt like it was the most heartfelt of all the versions I listened to. I love the words and how his voice completely captures the mood of the song. “Close your eyes and start a journey through a strange new world/Leave all thoughts of the world you new before./Let your soul take you where you long to be.” The feeling these words give me put me into the arena at Nationals during the night of the long program and I can see the moment. 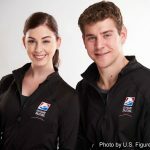 Regardless of the outcome, that program will be the culmination of eighteen years of skating. It has been a wonderful journey that has taken me to so many amazing places that, as a child, I could only dream of and, now, the dreams I have had the honor of living in as an adult. 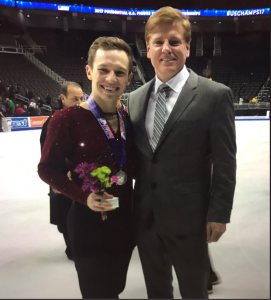 Hochstein (pewter medalist) with Oppegard at the 2017 U.S. Championships. FSO: Can you recap this year’s choreographic process with your coach/choreographer? GH: It is always an incredible honor for me to work with my coach and choreographer, Peter Oppegard. Again, because this is my final season, these programs mean so much to me, and Peter understood that. He really took the time to choreograph programs that translated the emotions I am having about my skating and life. He always allows me to put my own stamp on the programs and listens to the ideas I have for them. This year, I had a lot of ideas and it was fun to work with him to bring the ideas to life. FSO: Where will you debut your programs? How many summer competitions are you planning to do? GH: I will be debuting both of my programs at Skate Detroit [July 21-22, 2017] this year. I wanted to be able to skate at home in front of my family and friends one more time. Peter will not be going with me, but I think at this point, hopefully I can handle the pressure of coaching myself through a competition! I will also be competing at Glacier Falls [club competition in Anaheim, California] the following week. It’s a busy schedule, but I’m up for the challenge! FSO: How do you feel about your two Grand Prix assignments this fall? GH: I’m really excited about my Grand Prix events this year. I’ve never competed at Rostelecom Cup, so this will be my first trip to Russia. I will be attending my second Cup of China and Beijing is a city that I really enjoyed the first time around, so I’m looking forward to going back. FSO: Are there any places in Moscow you’d really like to see? What about in Beijing? GH: Like I said, I’ve never been to Moscow, so there is so much to see! I always try to get out and see as much of the city as I can, so I’m open to any suggestions that people may have for me to see or do. Obviously the Red Square and St. Basil’s Cathedral are must sees! Going to Beijing a second time is something I’m really looking forward to. Last time, I saved the Great Wall for the last day, but because I skated well and made the exhibition, I never got to go, so that is something I want to see. I’ve also been practicing my Mandarin, so I’m looking forward to embarrassing myself when I try to speak to the locals. One of the little girls who came from China to take lessons with me this summer is also going to come watch the competition, so that should be fun! 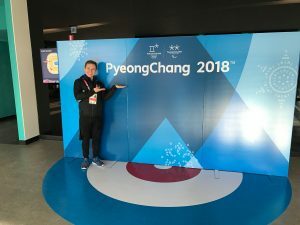 Hochstein at the site of the 2018 Olympics in Korea. The 2017 Four Continents Championships was held in the arena where the Olympic figure skating events will take place. FSO: Do you have any specific goals regarding your fall competitions and this season overall? GH: I didn’t have the season that I wanted last year. I got a little complacent and didn’t push myself as hard as I could have and that is something I really regret. I’ve worked hard this summer because I want to be happy with my season. Of course it is my goal to make it to the Olympics, but I have more specific and important goals for each competition. I want to leave each competition satisfied with my effort and knowing I did the best I could. I think by doing this, I will have a greater chance of accomplishing my ultimate goals. FSO: You ended last season with 3 quad toe loops in your programs (1 in short, 2 in long). Do you have any plans to add a different quad to your repertoire or to make any other notable changes to your programs? GH: My technical content will be very similar this year as it was at the end of last year. I’m not trying the two quads in the long at my summer competitions, as I am still trying to familiarize myself with the program. However, we have tweaked a few things and I’m looking forward to showing off the improvements I’ve made! In his outdoor nest (at 3.5 weeks old). FSO: Let’s end this interview with a fun, non-skating subject … Tell us about the new pet you have and the back story. GH: Yes, Caroline and I have a new pet! Since we moved last July, we have been taking care of a stray cat in our neighborhood. We feed her twice a day, bought a bed for her to put under my car for when it is raining, and sometimes sit outside and try to talk to her. For a stray cat, she has grown fairly attached to us. We can go near her, but she won’t let us touch her. However, she sits outside, under the car and waits for us to feed her in the mornings and at night. At the beginning of the year, the cat started to look somewhat chunky, so we tried to decide if we should put her on a diet or not. Qiu Qiu with Grant (4.5 weeks old). While that was happening, she disappeared for four days. Turns out, she was pregnant! She is a small cat and only gave birth to one little male kitten. 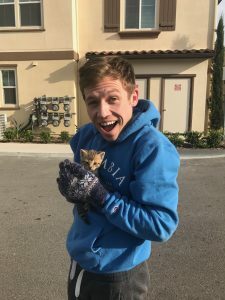 When we found out she had the kitten, we decided to up the amount of food she was getting and started feeding her the quality cat food! She moved to the bushes to have the baby and made her nest in there. 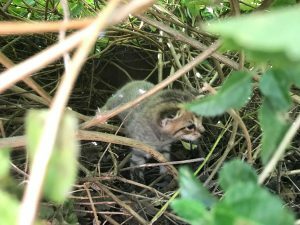 However, because they lived in the bushes, we had to get into contact with the HOA (homeowner association) to make sure they didn’t trim them, especially because the kitten was a newborn. About a month after, we got a letter that the parking areas were going to be repaved. So for us, it only made sense that we would adopt and try to save the baby. At this point, we had been out visiting the baby, but not touching. We would go to the nest and talk to him so he would get used to us. 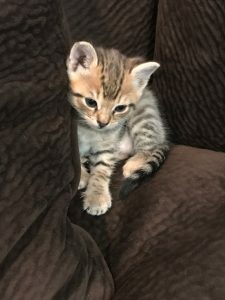 Eventually, we took one day to sit around and were able to get the kitten to come out to us. Oddly enough, the mother cat let us take her baby. Scariest decision and “what did we just do?” moment! He was only 4 and a half weeks old, but it was definitely the right decision for us to make. That is the age when they start to wander away from the nest and since the repaving was about to take place, we knew it was a risky decision to leave him. Also, the hedges needed to be trimmed after a month. In our minds, we had to do it. It was a bit of an adjustment and still is. We’ve never owned a cat, especially one so young. Now he is just over three months and still a handful! But he comes to the rink with us every day (yes, I’ve become one of those people…) so he is great with people, especially children, which is something that is important to us. He gets along with our dog, Kingston, which is also great. 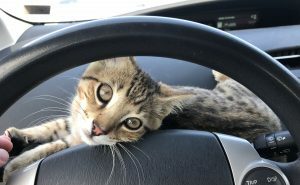 Anyways, I’m rambling, but we have a new little boy kitten named Qiu Qiu (“ball ball” in Chinese [Editor’s note: click here for more language info] because he was a little round when we first got him). What an exciting addition to our family!